THE WOODLANDS, TX. — Houston All-Star Shooting Guard James Harden was on hand for basketball instruction and fun at the 2014 Kroger James Harden Basketball ProCamp. Location: Legends Sports Complex, The Woodlands, Texas. Dates: Aug 09 – 10, 2014. Session 1 Time: 9:00 AM to 12:00 PM for boys and girls grades 1 – 6. Session 2 Time: 12:00 PM to 4:00 PM for boys and girls grades 7 – 12. Cost: $199. Source: Procamps.com. Campers experienced various stations, specializing in fundamental skills of basketball. Each camper was placed on a team according to his or her age. James Harden gave talks highlighting the finer points of the game of basketball and beyond. Parents & guests were able to listen in designated areas at each location. 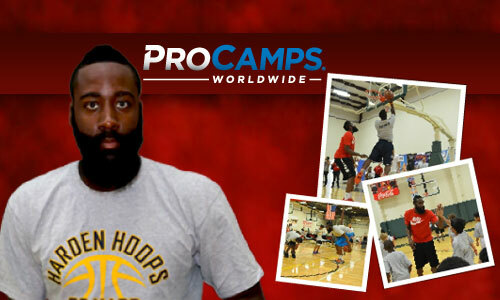 Watch the following video where shooting guard James Harden shows 2013 campers his off the wall dunk. James Harden is an NBA shooting guard who plays for the Houston Rockets. He was a first-time All-Star in 2013, his first season with the Rockets. He was named NBA Sixth Man of the Year with the Oklahoma City Thunder in 2012. If you would like to book sports stars or athletes like James Harden for a speaking engagement, autograph signing, product endorsement, fundraiser or special event, contact James Harden’s booking agent for appearance and speaker fees at Sports Speakers 360. For booking agent and appearance fee information on how to hire Houston Rockets players for corporate events or personal appearances, call 1.855.303.5450.